Clean One Owner with Blue tooth and Heated Leather. The 2014 Subaru Legacy has a spacious cabin and standard all-wheel drive. The Subaru Legacy is one of the only midsize cars with standard all-wheel drive, which inspires confident driving in harsh weather. Powering the all-wheel-drive 2014 Subaru Legacy is a 173-horsepower four-cylinder engine, which produces acceptable acceleration. A six-speed manual transmission is standard, and a continuously variable automatic transmission is available. Some Legacy models come with a 256-horsepower six-cylinder engine that generates greater power for highway driving. With the base engine and automatic transmission, the Legacy achieves 24 mpg in the city and 30 mpg on the highway. That's below average for the class, but all-wheel-drive cars typically return lower fuel economy ratings than cars with front-wheel drive. 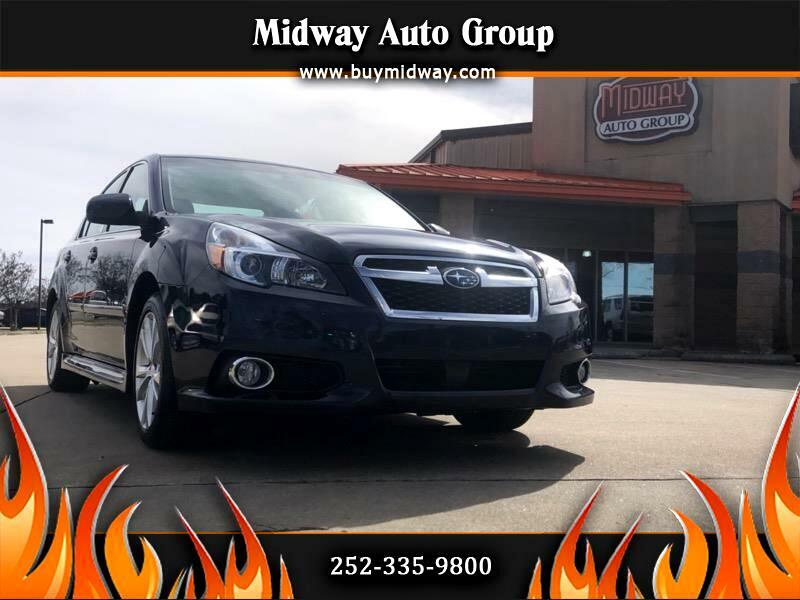 The Subaru Legacy has a comfortable ride, and it feels secure on winding roads, thanks to its responsive steering and all-wheel drive. The 2014 Subaru Legacy sedan has a good-looking interior, but it shows its age when compared with some competitors' modern, higher-quality cabins. The five-seat Legacy has generous space for occupants in both rows, and those in the front have an excellent view of the road ahead. The 2014 Subaru Legacy comes standard with Bluetooth phone connectivity, a USB port, and an auxiliary audio jack. Dual-zone automatic climate control, navigation, satellite radio, and a number of safety features are available. Pricing on the 2014 Legacy sedan ranges from about $13,300 for the 2.5i base model with a four-cylinder engine and six-speed manual transmission up to $19,000 for the Legacy 3.6R Limited, which includes a six-cylinder engine and a five-speed automatic transmission. However, pricing can vary depending on the car's location, equipment, condition, and mileage. The 2014 Subaru Legacy earns an above-average reliability rating of four (out of five) from J.D. Power. The 2014 Legacy has a great safety score. The Insurance Institute for Highway Safety named it a Top Safety Pick+, the agency’s highest award. In IIHS crash testing, it earned a rating of Good (the highest score possible) in all but the small overlap front. In that test, it received the second-best rating of Acceptable. The National Highway Traffic Safety Administration gave the 2014 Legacy five stars overall. Likewise, it earned five stars in all three of its crash evaluations. Message: Thought you might be interested in this 2014 Subaru Legacy.